Der Orchard Temple ist ein bescheidener und abgelegener Ort, um Ihren Aufenthalt zu genießen. Unser Orchard Tempel ist ein bescheidener und abgelegener Ort, um Ihren Aufenthalt zu genießen. Es liegt eingebettet in die heimische hawaiianische Vegetation mit einem wunderschönen Obstgarten und Meerblick. Der Orchard Temple ist perfekt für den romantischen Kurzurlaub, den Sie schon mal erlebt haben. 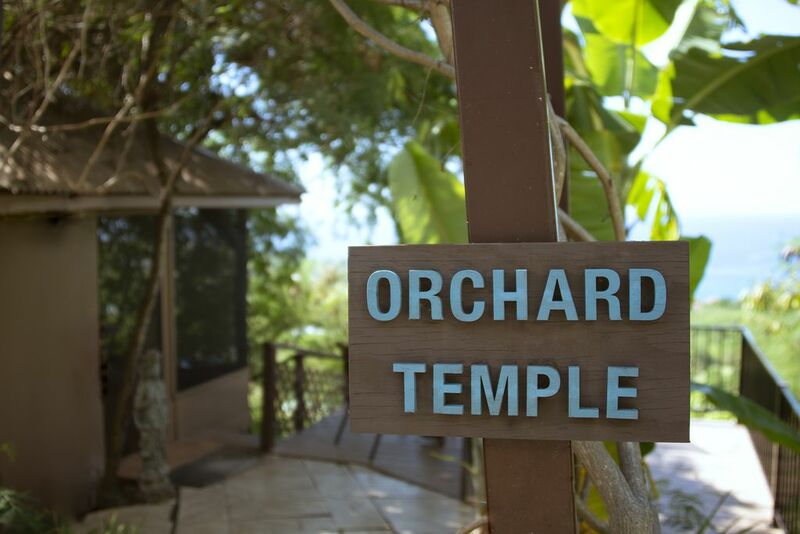 We stayed at the Orchard Temple and were enchanted with the magnificent view - truly a magical place. We fell asleep to the sound of the ocean waves and woke to the call of roosters and birdsong. Be aware that this is truly a rustic space and we were surprised that there were no windows, simply screens - the plus is we could enjoy the salty breezes and felt we were outdoors; the minus is that we had a couple of unusually cold days with winter storms and the rains came in. The owner was quick to check on us, however, and bring extra towels to soak up the water on the floor. We understand this was unusual weather. There is an indoor toilet and sink, and a private outdoor shower. We didn’t have hot water one day which was fixed promptly. Know that adorable geckos were our daily companions, and are considered good luck. The kitchen is fully equipped and has all the necessary equipment to take advantage of the amazing local Kona coffee - there’s even a grinder. The roomy table on the lanai is the perfect spot to have breakfast and look for whales and dolphins - we saw whales on 4 days of our Stay so the sanctuary is truly well-named. We loved the peaceful location away from the bustle of Kona. Thank you, Jeff, for creating such a lovely and restoring place. We loved the view of the bay, the healing energy and the humble but perfect space. 4 stars for this place, instead of 5 because honestly the space was not clean or cared for. I did not have a hot working shower during my stay. Our request for a fix was sadly ignored. Despite this inconvenience I would stay here again. It is a magical spot. The guest was correct however not "ignored" As Hawaii is and is explained in the Welcome Guides in each room WhaleSpirit cell service and internet is not always perfect. In this very rare case the manager simply did not get the message until days later after the guest had already left. We felt bad about that but all we could then do was fix it moving forward. Since then the showers have been consistently hot! UPDATE: We started new management Nov 2017. After many, many years of previous neglect 2018 was the year of major transformation and upgrades. During this year we were very transparent to all that booked that although we were decided to remain open for business we were in process improving just about everything at the Sanctuary. To be fair we also listed our prices below rate and all our descriptions had explained that we were in process of doing a lot of improvements. As much as we wanted to do it all at once we only had so many hours in day and days in the week. Just about all our guests were very kind, gracious and understanding as we were not to the standard we wish to be. We hope this above review will not deter you from at least looking at all the new photos and changes we made. If you are interested but have questions or concerns because of this review, you are more than welcome to connect with me at any time. We are so proud of our 2018 accomplishments to make this sacred sanctuary a beautiful place again. We hope you will come stay with us and allow yourself to be immersed in the powerful mana of the Hawaii energy and spirit that permeates our sanctuary. We enjoy our stay. It's pefect view of the bay and very quite. All was there what we Need, only the laundry is extern. The house Supervisor Ben is very kind and helpful. Only a gardener was unfriendly. Yes, we heard about our gardener's 'personality' was not of the Aloha spirit that we wanted for the land and our guests so we very quickly found someone who does. UPDATE: We started new management Nov 2017. After many, many years of previous neglect 2018 was the year of major transformation and upgrades. During this year we were very transparent to all that booked that although we were decided to remain open for business we were in process improving just about everything at the Sanctuary. To be fair we also listed our prices below rate and all our descriptions had explained that we were in process of doing a lot of improvements. As much as we wanted to do it all at once we only had so many hours in day and days in the week. Just about all our guests were very kind, gracious and understanding as we were not to the standard we wish to be.